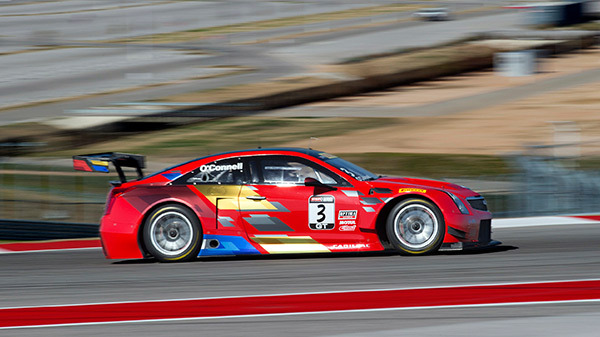 Cadillac Racing and the Cadillac ATS-V.R enjoyed a strong start to the 2016 Pirelli World Challenge season after Johnny O’Connell and team newcomer Michael Cooper scored three podiums across two races at Circuit of the Americas this weekend. Cooper, who is in his first season with Cadillac Racing after replacing Andy Pilgrim in the No. 8 ATS-V.R, managed to score a podium in his first-ever PWC GT-class race Saturday. After starting from second on the grid Cooper found himself trailing the Porsche 911 GT3 of Patrick Long and the Nissan GT-R of Bryan Heitkotter. The Porsche and Nissan began to pull away from the Cadillac as the race wore on, however, and Cooper was forced to turn his attention to holding off the Nissan GT-R of James Davison. He would go on to finish third, with Long in first and Heitkotter in second. Sunday saw a stronger outing from the Cadillac squad despite both O’Connell and Cooper starting behind the front row of the grid. When the green flag flew, Long was almost immediately taken out by Davison, which put an end to the Porsche driver’s day and put out the yellow flag for about 20 minutes. This bumped the Cadillacs up the running order for the restart, which was led by Davison. When the green flag flew Davison was given a 10-second stop-and-go penalty for avoidable contact, handing the lead over to pole-sitter Heitkotter – who had both Cadillacs in tow. O’Connell passed Heitkotter for the lead at Turn 13 with 17-minutes to go and was soon forced to forfeit his second-place spot to Cooper after suffering a flat tire. The Cadillacs would go on to finish 1-2 with Jon Fogarty and his McLaren 650S winding up third. Click here for full results from Race 1 at COTA and here for full results from Race 2. Cadillac Racing will be looking to continue their dominance over the PWC series when they join the Verizon IndyCar Series in Florida this week for the St. Petersburg Grand Prix.